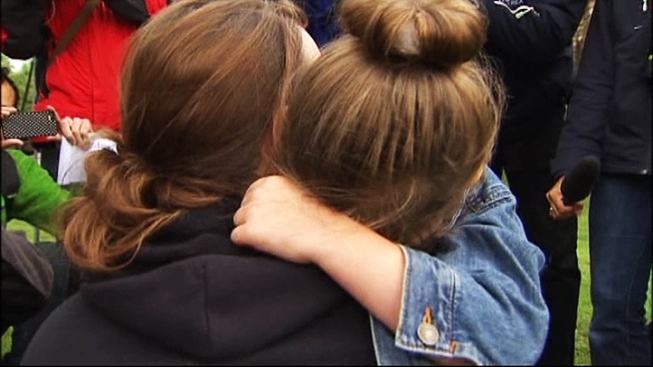 Despite a soaking the Oklahoma City metro area received Thursday morning, hundreds of parents showed up at schools in Oklahoma City to reunite with teachers from the two schools hit hard by this week's twister in Moore, Okla.
Outside of Plaza Towers elementary's reunion, the parking lot was packed. Carly Rodriguez picked up her daughter from early Pre-K that morning and feels lucky. She showed up with thank you cards for the teachers. "Thank you for everything they've done for us, for everything they taught her in first year of school," she said. Scott Lewis also picked his son up from Plaza Towers. He picked him up just minutes before the tornado hit. Lewis's family rode it out in their storm shelter. He now knows some of the children who died were in his son's classroom. "I have mixed feelings about being able to get my son to safety and other parents couldn't get there, some were tied in traffic and just weren't able to get to their children," said Lewis. Lewis said last night he was able to get the newspaper and point out to his son friends that "did not make it out from the storm." "This will bring a little more impact to what happened because you're not going to see some of your friends," said Lewis, about his son. It will be a long healing process, parents acknowledge. Thursday though, as they expressed gratitude, they also felt comfort in knowing they're surrounded by such amazing educators who will be there to provide support during that healing process.